No, I haven't picked up a sponsor for this blog. 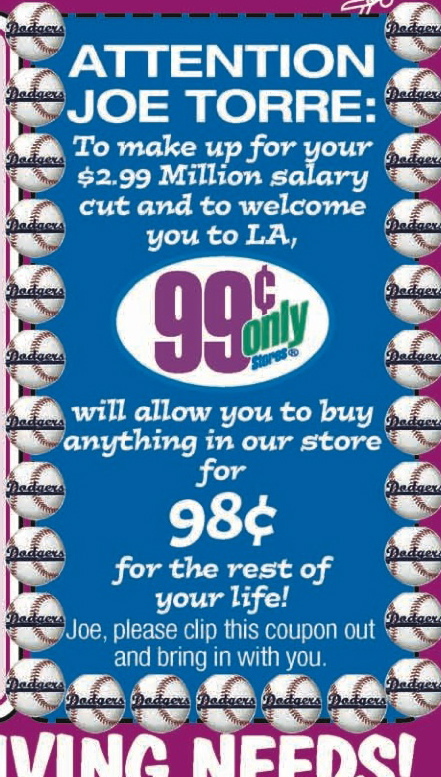 Instead this is the ad for the 99 Cents store that ran in yesterday's Los Angeles Times. There are three things that captured my attention. #2 I'm no good in the kitchen. What the heck is a "Charger Plate"? At only 99 cents, how can it not only hold food plus charge stuff? Where do you plug it in? I'm serious. What is that? #3. A close up, please. Well, it's about time the big corporations starting looking after the working man. At least someone is trying to make new Dodgers manager Joe Torre move to Southern California a little easier. He took a big pay cut to go there plus he has to pay for the move and finding a house won't be cheap. At a penny saved per item bought at the 99 Cents store they are practically paying him to shop there! 1. The major soda companies tried 3-liter bottles in the 90's, but only Shasta and cheaper ones still have them. I think Coke & Pepsi dropped them since they went flat WAY too fast. 2. If you are the 99 cent store and you have your aluminum trays for 59 cents, wouldn't that just send everyone into a tail spin? 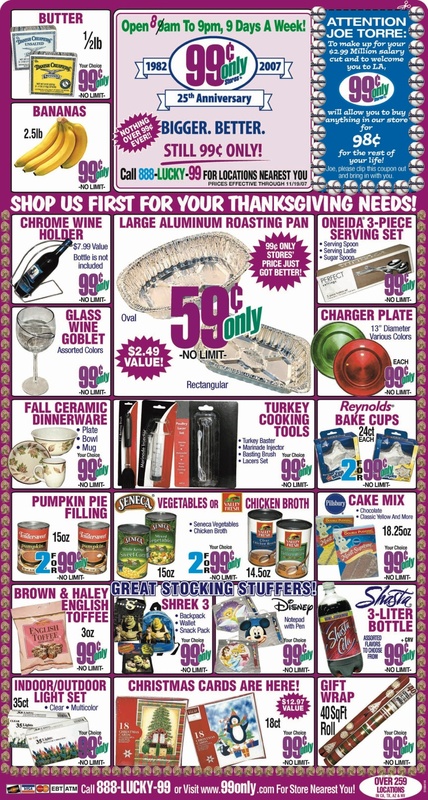 Also, would you trust your Thanskgiving turkey on a 59 cent pan? I'm a fan of the Shasta soda. Their Orange soda is simply the best over any soda out there...but when it comes down to it, Pepsi is my all time fav...sorry Bean..I know you like the Coca-Cola.. Happy Birthday Bean! Hope you get what you want... probably something freaky. Happy Birthday, Sir. Keep up all the good work. I just hope Torre remembers to clip the coupon and bring it with him! You know how sometimes when you go into a very nice restaurant and first sit down at the table, there's a big, pretty-looking metal plate, which gets whisked away either before you eat anything or after serving as staging area for your first plate of food? Damn, I love the 99-cent store. Kitchen stuff you never knew you needed, food perishible and non-, and humanitarian gestures? I hadn't realized until just now that there is a trifecta for discount stores, but they've hit it. Take that, Big Lots! I know a Joseph(don't call me Joes) Torre. I wonder if all Joe Torre's get the special or just the unibrowed one. Thing that make you go hmmm! oh yeah- happy Coventry Blitz day! 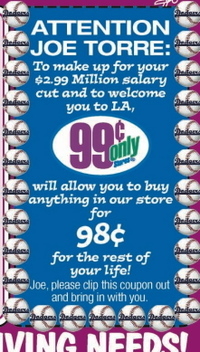 Do you think the 99 cent store will extend the same offer to A-Rod if he comes to L.A. for less than $30 million a year? That may be some info the Dodgers or Angels want to mention to Scott Boras to sweeten the pot! god i love 99 stores and dollar trees and well any store i can buy crap i dont need for a dollar. First.. a I wish you a happy birthday! okay... Did anyone notice they are open 9 days a week... really... NINE days a week. they are silly, dont they know there is only 7 days in a week. Happy Birthday Bean!!! Glad your blog is back up so we can celebrate it with you this year. Really enjoying the blog! BTW. You get the LA Times up there in Seattle? Happy Birthday! Hope you treat yourself to an extra tall stack of pancakes. I'll have mine on Sunday. happy bday! yea sometimes their ads are funny, like the condom ones. By the way, Warren Buffett told us all this would happen. In mid 2002, for the first time in his life, he began buying foreign currencies, thus betting against the dollar. He explained his reasons most extensively in a Fortune article he wrote (Nov. 10, 2003). The main factor he cited, the trade deficit, is much worse now. For a year or two after the article, his bet seemed to be a loser. But now, as usual, he looks prescient. warren is money. he also sold his laguna beach pad a while back. smart! Many happy returns, Bean. Hopefully, your delightful island is completely devoid of the plakton that is the 99 Cent Store, although that message to Joe Torre is pretty effing funny. Bean, how much time do you have on your hands that you pay that much attention to the contents of a 99 cent store flyer? Happy Birthday. I've wrapped Hayden Panettiere and shoved her in a flat rate USPS box to ship to you. Let me tell you, she did NOT want to get in that box. dude it your birthday???!!!!! damn it bean have some pancakes, visit a 7-11, or stalk the post office....it your b-day and you are entitled to fun and debauchery.....so let donna out of the barn. You could have been such a productive man. 99 cent store dinnerware is quite nice. I like that you can mix and match. My name is Brian and I’m a 28 year old professional butler. I came across your blog today and saw your question about charger plates. So here is your answer. A charger plate also known as a service plate or place plate is used only for decoration. At a formal sit down dinner, the charger plate is placed on the table before guests sit down so that the table doses not look “naked”. It should always be removed after the first course. It is believed that it got its name from knights in the medieval times who would sit down to eat a meal out of there shield, also called a charger. Being that there were no plates on the battle field. If you are ever curious or have any questions about etiquette and manners or things of a formal nature, please feel free to contact me. I have a great many fascinating facts. Love the 99 cent store! Much like Target, I can never walk away empty handed - I always find something I "need!" It's great for cleaning supplies. Bean, you've never heard of a 3-liter bottle of soda? Somehow you struck me as the sort of person who would have. Well just FTR, in person they basically look like a fatter version of their more popular 2-liter sister, much like Mia Tyler. These are mainly a regional thing. For example, when I lived in the Fort Worth area, they were rare at best. But, now that I live in Austin, I find that they are quite common down here. Also, sometimes chains will sell 3 liters exclusively so that they don't have to "ad match" competitors' 2-liter sale prices. For example, for years WalMart had a special deal with Coca-Cola so that Coke would make 20-packs of soda for WM only. That way the retail giant would not have to offer ad-matching on $3.99 (or whatever price) Coke 24pks at a different chain. Yes, I've spent way too much time in retail. I have A friend that lives in El Paso, TX and discovered the 3 liter sodas when I went to visit him. It's hard not to find 3 liter sodas in any brand. They have them across the border there too. I even brought some cokes back for my friend that loves Coke and didn't believe me when I told her. The 3 liter bottle is a nod to the Mexican influx. If you go to a grocery store in Mexico, they have 3 liter bottles of soda in every variety. It's extremely common. They even have 3 liters of the apple soda they added to the big gulp dispenser. I think the 3 liters are because of the bigger Mexican families or something. Is the Joe Torre joke in the ad the only thing this has to do with sports?